Cinema=Godard=Cinema | "When you see your own photo, do you say you're a fiction?" Here is Wild Bunch on the latest film. “Nothing but silence nothing but a revolutionary song a story in five chapters like the five fingers of a hand”. According to Wild Bunch, Godard’s next project is called Image et parole, shot in various places including Tunisia. Michel Hazanavicius is directing Redoubtable, a tale of Godard and his second wife Anne Wiazemsky in the late 60s. It’s a love story. By the guy who made The Artist. Godard et les représentations du monde, Université de la Sorbonne Nouvelle, Nov 30-Dec 1. 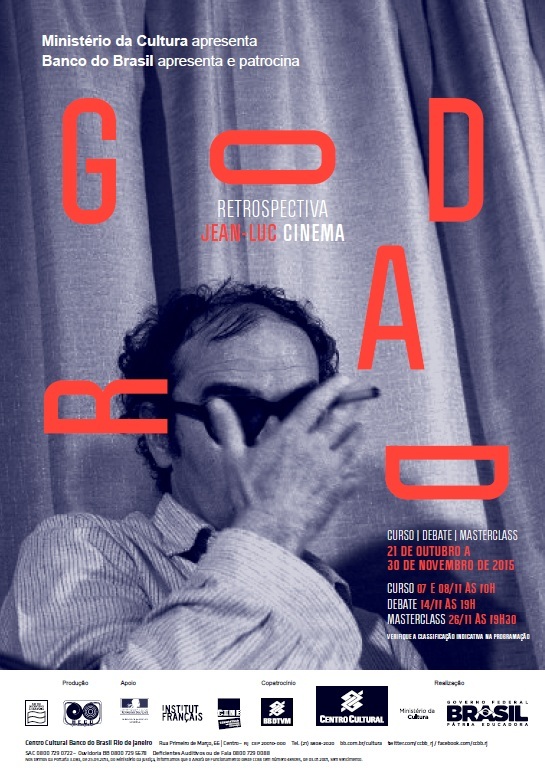 A retrospective of Godard’s 104 works at the Centro Cultural Banco do Brasil in Rio de Janeiro, Oct 21st-Nov 30th, including lectures and discussions. Includes a great looking program book – wonderful cover! UPDATE: The book is now titled Phrases: Six Films, and is due out in late April 2016. Late Godard ‘Goodbye to Language’: Digital + 3D Cinema to be held at University of Technology Sydney, Oct 21-22, 2015. Michael Witt has just published the excellent In Search of Godard’s ‘Sauve la vie (qui peut)’, which discusses his research on Godard’s compilation film screened at the Rotterdam Film Festival in 1981, meant to compliment his feature Sauve qui peut (la vie) which was also playing at the Festival. Witt’s essay is a follow-up to his 2013 lecture and screening of a digital reconstruction of the film. Godard has responded to winning the Prix cinéma suisse in a manner similar to his Cannes’ Letter in Motion. Craig Keller has posted some very helpful thoughts on, as well as a transcription and English translation of, Prix Suisse on Mubi Notebook. Godard, Swiss national since 1953, will be given the 2015 Swiss Film Honorary Award from the Swiss Federal Office of Culture on March 13th, which includes a monetary prize of CHF 30,000. “Jean-Luc Godard has made over 40 films and video experiments”. Swiss-made only?